During the RiverFire Festival, the River Walk Bridge in Berlin is decorated with hundreds of creatively carved jack-o-lanterns. The festival, which takes place at the Northern Forest Heritage Park in Berlin, draws more than 5,000 people, and features a day of family-friendly Halloween fun and food before the dramatic lighting of the Androscoggin River at dusk. 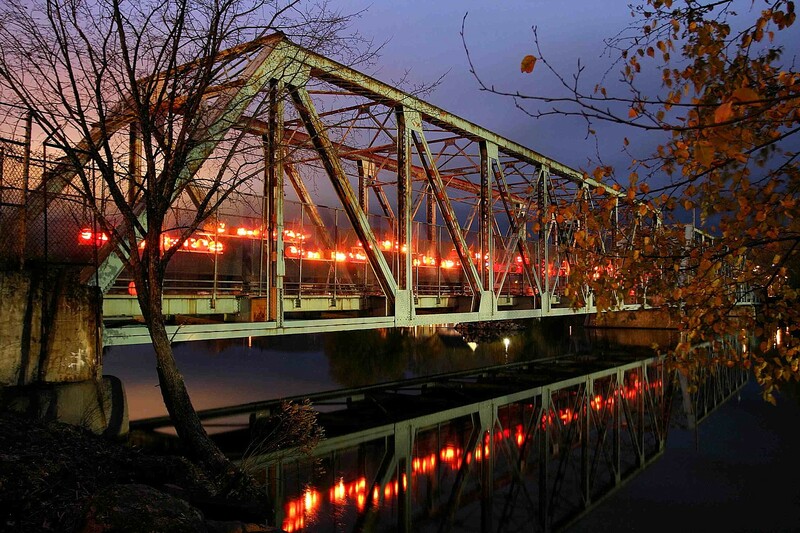 Burning brighter and hotter than ever with hundreds of jack-o-lanterns and bonfires illuminating the river, the spectacular annual RiverFire Festival presented by Service Credit Union in Berlin will set the Androscoggin River ablaze at dusk on Saturday, October 17. Now in its 12th year as one of the Grand North’s most celebrated events, the RiverFire Festival draws more than 5,000 people each year to the Northern Forest Heritage Park, 942 Main Street in Berlin, to take part in a day of family-friendly Halloween fun, food and promotions before the dramatic lighting of the Androscoggin River. RiverFire festivities will kick off at 2 p.m. with free admission. While the fires appear to be floating on the water, the blazes actually burn on the historic boom piers dotting the river. The piers were used during the height of the logging era, when they separated and guided lumber as it floated down the river to the mills of Berlin. During RiverFire, the boom piers are stacked with skids and set on fire creating a dynamic contrast between the dark waters and the bright orange flames. Along with the bonfires, the River Walk Bridge will be decorated with hundreds of creatively carved jack-o-lanterns. To go along with the spectacular fires on the water, other family-friendly activities include hay rides, pumpkin carving, a petting zoo, duck races, a bouncy house, a children’s Halloween costume parade, and mouth-watering food. The third annual Zombie ATV Poker Run has become a big hit at the festival. In a new nighttime feature this year, RiverFire will also include laser tag from 5 to 9 p.m. In addition, Duke, one of New England’s best country rock bands, will kick off evening festivities with some great live tunes. Food vendors and the 21-plus Beer Tent will be available throughout the afternoon as well. For more information on the schedule of events and activities, visit: http://www.androscogginvalleychamber.com/riverfire-festival/schedule/. In the third annual Zombie ATV Poker Run, ATV enthusiasts dress in zombie costumes and decorate their ATVs for a chance to win prizes for best costume and most festive ATV. Register at White Mountain ATV Rental, 299 Main Street in Gorham, and ride to the Northern Forest Heritage Park in Berlin. Registration takes place on October 17th from 9-11 a.m. Parking is free. The third annual RiverFire 5K Run/Walk, which is hosted by Coos County Family Health Services, begins at 2 p.m. Runners leave from Heritage Park, proceed over the 12th-Street Bridge to the cemeteries and return to Heritage Park. For more information and to register, please visit: http://www.coosfamilyhealth.org/riverfire.pdf. RiverFire presented by Service Credit Union is hosted by the Androscoggin Valley Chamber of Commerce. Sponsors include Service Credit Union, AutoNorth Pre-Owned Superstore, Northeast Credit Union, Brookfield Renewable, Northway Bank, Bank of New Hampshire, Great Northwoods Container Service, ReMax Northern Edge Realty, Capone Iron Corporation and Nordic Construction. For additional information, call (603) 752-6060, or click on www.riverfirenh.com or www.facebook.com/riverfire.berlinnh. 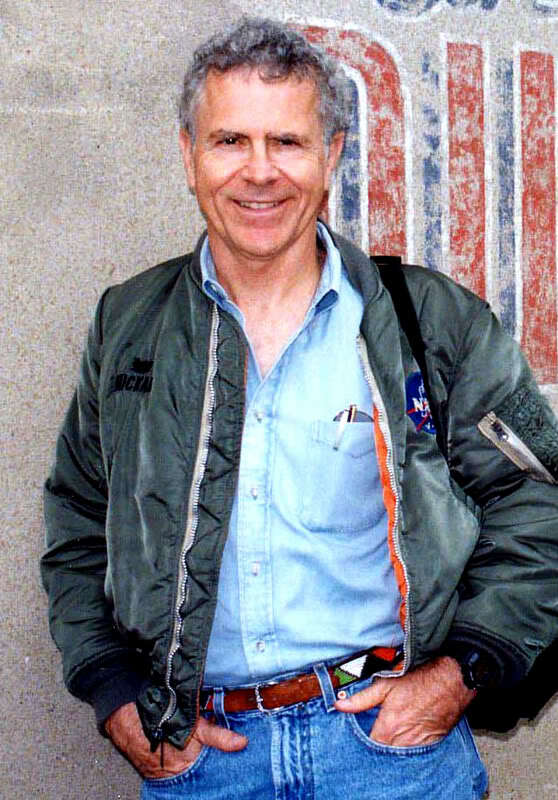 Homer Hickam is coming to Beckley, West Virginia, October 3-5 for the Rocket Boys/October Sky Festival. The Rocket Boys/October Sky Festival central location is Beckley’s New River Park, which boasts an authentic exhibition working coal mine that will be open for discounted tours, taking riders on a motorized tour 1,500 feet underground. The park also features an award-winning youth museum and planetarium, great Appalachian food, a complete full size replica of a 1950’s mining town like Coalwood, a miner’s museum, and more. Fans of Homer Hickam’s New York Times #1 best seller “Rocket Boys” and the movie version “October Sky” will have the opportunity to enjoy free autograph signings and photo ops with actual Rocket Boys Hickam, Roy Lee Cooke, Jimmy “O’Dell” Carroll and Billy Rose and movie cast member Chris Ellis. Mr. Ellis is one of Hollywood’s most prolific character actors; in addition to “October Sky,” Chris has appeared in dozens of movie and TV roles in his three decade career including “Apollo 13,” “Armageddon,” “Batman-The Dark Knight Rises,” “Catch Me If You Can,” “Transformers,” “That Thing You Do,” “Days of Thunder,” “My Cousin Vinny,” “Law and Order,” “CSI,” “The Mentalist,” “The Office,” and more too numerous to mention. Fans of Universal Studios “October Sky” can enjoy a special movie screening as part of the festival hosted by Ellis and the Rocket Boys. Prior to the screening, Chris will conduct an informal actor’s workshop and “Inside the Actor’s Studio” Q&A session, with behind the scenes details on the movie’s filming and how Hollywood made Coalwood come to life on the big screen. This year’s festivities will also include a Friday night “Rocket Boys Rock & Roll Caravan” presented by the Beckley Concert Association. The world famous “Bill Haley’s Comets,” the band often credited with having the first ever Rock and Roll hit, will headline the show. The Comets name was inspired by America’s 1950’s fascination with space will perform their classics including “Rock Around The Clock,” “See Ya Later Alligator,” “Shake Rattle and Roll,” and lots more. The Comets special guests will be beach music pros “The Entertainers,” direct from Elsie Hickam’s favorite spot, Myrtle Beach South Carolina! Festivalgoers will also enjoy free live music on Saturday at the Rocket Boys/October Sky Festival grounds from several artists, including the award winning bluegrass band Johnny Staats and the Delivery Boys. The annual Rocket Boys/October Sky Festival will include a writers workshop hosted by Homer Hickam for aspiring and seasoned authors, as well as book signings from other notable writers including Dreama Denver, wife of late “Gilligan’s Island” star Bob Denver who will be signing copies of her memoir “Gilligan’s Dreams,” and Daniel Boyd, the West Virginia filmmaker (“Chillers,” “Invasion of the Space Preachers,” “Paradise Park”) and author whose latest graphic novel “Carbon” is set in the West Virginia coalfields. Saturday evening is topped off with a huge Chili Night celebration, which annually attracts thousands of visitors to downtown Beckley. Sunday will feature a chartered bus tour to the town of Coalwood to see many of the sites featured in the book and movie, hosted by Rocket Boy Roy Lee Cooke, and includes a homemade lunch in Coalwood. Fans of Homer Hickam’s books come in great numbers each year to get a chance to meet the New York Times #1 best selling author and see the sites and characters portrayed in his Coalwood series of memoirs. “Rocket Boys” Roy Lee Cooke, Jimmy O’Dell Carroll, Billy Rose and Hickam himself return each October to visit old and new friends and share stories of the “Coalwood Way.” Every year the crowd grows, drawing in fans both national and international as well as busloads of students from West Virginia and surrounding states. Many can be seen carrying their own treasured, often dog-eared, copy of Hickam’s “Rocket Boys,” one of the most read books in schools. Hickam’s books will be available for purchase and autographing at the festival. One of the Rocket Boys/October Sky Festival highlights is the dozens of students from schools all over America who join Hickam and the other Rocket Boys to launch rockets at New River Park’s hilltop “Cape Coalwood” launch pad. Rocket kits and launch supplies will be available for sale at the festival. Proceeds from the sale will benefit the Rocket Boys/October Sky Festival and the local chapter of the American Red Cross. Construction and launch is easy – even for first timers. Students from Homer Hickam’s alma mater Virginia Tech will be there to assist. NASA representatives from Goddard Space Flight Center will also be in attendance to talk rockets and space with festival-goers and provide their rocketry expertise. Beckley, WV is located on Interstate 64 in southern West Virginia, and is also accessible via Beckley/Raleigh County Airport with daily non-stops via United Airlines to Washington Dulles airport and Amtrak service on the Cardinal line. More information on the Rocket Boys/October Sky Festival, including a complete schedule of events and lodging information, is available online at http://www.rocketboysfestival.com.